Lugging around a laptop is no longer the only solution to getting work done away from the office. Mobile phones may not replace laptops anytime soon, but new smartphone advances enable business users to accomplish more work-related tasks on your phone than ever before. Highly mobile workers across a variety of industries and roles now use smartphones as their primary mobile computing tool. And, according to a study from Frost & Sullivan, workers estimate their productivity gains from mobile devices at a massive 34 percent. But for many field-based workers, at the end of the day they still return to the office to complete reporting and other productivity tasks on a desktop or laptop, with the comfort of a monitor, keyboard and mouse. Samsung’s new Desktop Experience station, or DeX, is set to put a new twist on this scenario. A portable hub that connects to your HDMI monitor, keyboard and mouse, it allows mobile workers a way to access a desktop experience simply by docking their Galaxy S8 smartphone. Field technicians often find themselves in tight, dirty and dark spaces trying to fix mechanical issues, run wire or gather data. Using a laptop would be cumbersome, if not impossible in some situations and environments. With a smartphone in their pocket, a field technician can look up product specs, warranty information or instructions from anywhere. They can also video conference or “telestrate” with specialists at home base to troubleshoot technical issues. In the past, technicians would have to return to their office and boot up their laptop in order to complete key productivity tasks. This is where DeX can help, providing a convenient desktop experience powered by their mobile device. Since they are still working on their mobile device, the field technician will have immediate access to any photos taken with their phone onsite, as well as the same mobile workflow apps. And because DeX is compatible with VDI solutions such as Citrix and VMware, the technician can also launch a Citrix session to access their full Windows virtual desktop and applications. Dragging around a laptop is no fun for real estate agents who spend most of their time booking appointments and showing clients residential and commercial properties, but they do need a desktop experience for a few hours a day to perform certain tasks, such as creating and editing large documents. Docking their smartphone to the DeX station allows them to open and work within multiple windows, whether checking the real estate listing site, writing a customer email or editing images or advertising materials. As an added bonus, since they are working on their smartphone, they won’t miss any calls or texts from their clients and can respond right from the DeX. Contacts and calendar will be within easy reach, with no switching back and forth between devices. Here are three ways you can save time by extending your smartphone to the desktop. Few roles have become as reliant on their smartphones as sales. Whether for the basics of calls, calendar and email, or for reporting on-the-go via a CRM app like Salesforce One, mobile devices help sales reps be more responsive to customers, and spend more time selling and less time on administrative duties. With mobile devices now able run core office productivity apps, giving presentations off-site is easier than ever before — no matter the environment. With DeX, all that’s needed is a screen, keyboard and mouse. Then, with the phone powering the desktop, a sales rep can open PowerPoint or Excel, pull up their presentation from their cloud storage provider of choice and start presenting, with the mobile device serving as an access point to their favorite Android and Windows applications. Mobile computing has come a long way in just a few short years, but it’s not done evolving. In the future, with the ability to transform a smartphone into a desktop, more business users will be pulling out their mobile devices to work, both while on the go and at their desks. 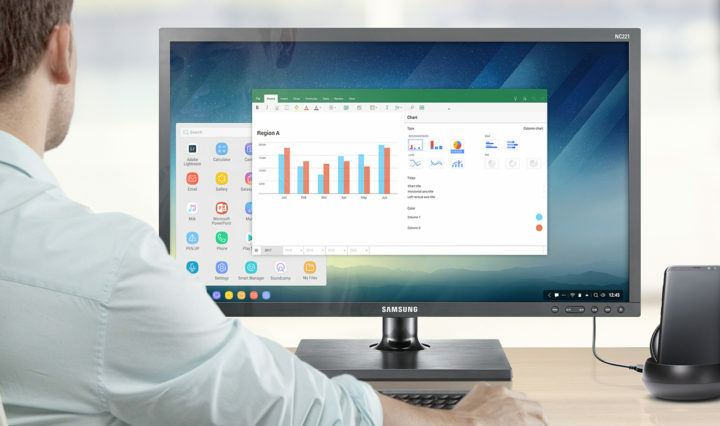 Learn more about how Samsung DeX lets you leave your computer behind and get more work done.